On Monday 15 January, Carillion plc, one of the UK’s largest construction companies, announced it was to go into liquidation. The collapse of Carillion has had wide ranging implications and serious questions are being asked in the UK as to how this collapse could have happened. Prior to Liquidation, Carillion employed 43,000 staff globally, with around half of these in the UK. It was responsible for some landmark projects in the UK, including the Royal Opera House, the Channel Tunnel and the Tate Modern museum. As well as construction, it also helped operate an array of government services, including running prisons, delivering school lunches, and maintaining schools and courthouses. 1. Why liquidation rather than administration (UK equivalent of examinership)? Under administration legislation in the UK, a company can continue to trade while “under administration” as the administrators seek to find a buyer for the assets of the company, similar to an Irish examinership. While an Irish examinership has a 100-day time limit there is no such time limit in an administration and so it is a widely used restructuring process in the UK. Carillion did not however seek the appointment of an administrator, and instead applied to the High Court to have the company placed into liquidation immediately. It can be assumed therefore that there were very little valuable assets left in Carillion which could have been sold by an administrator. It appears the main assets of the company were its contracts, where the margins were apparently too low to meet its ongoing liabilities or even too low to be considered as saleable assets. 2. How did Carillion get its self into this position? The company had nearly £900m of debt on its balance sheet in addition to a pension deficit of £587m. They were able to run up this debt on the basis of the strong contracts the company had, many of them long-term contracts with the UK government. However, many of these contracts proved to be much less profitable that everyone expected and in 2017 they were forced to write down their value by £845m. It appears that Carillion were bidding for contracts at very low margins in order to win contracts, which in turn provided the necessary cashflow to pay its current suppliers and lenders. Eventually the banks stopped providing support and when the UK government also failed to support the company in early January, there was no option left but to liquidate. Put plainly, the company simply ran out of cash. Although Carillion was a massive company with huge government contracts, its fundamental problem was one of cashflow. It is being reported that the company had only £29m in cash left at the date it was liquidated. With almost £2bn of debts, this is a staggering level of indebtedness. Although the amounts in this case may seem large, this is an issue that can affect any company from the smallest owner-managed business to the largest public company. Carillion was funding its cashflow shortage on existing projects from wining new contracts and in order to ensure it won those it was bidding at prices that were unsustainable. It was in effect chasing its own tail. Without careful cashflow management, this is a situation in which Irish companies or all sizes can find themselves in. 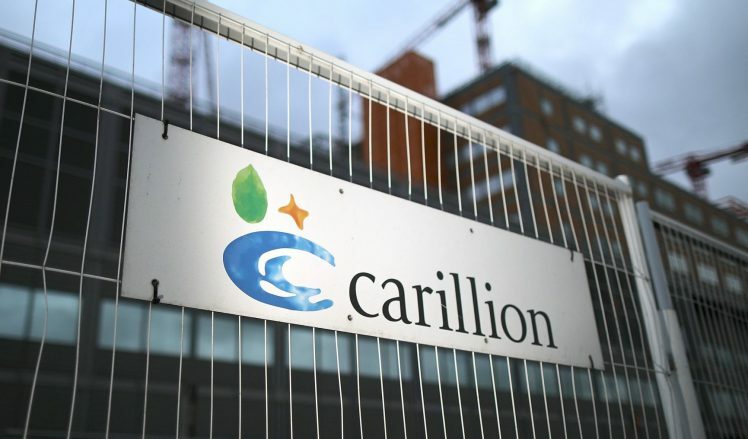 Carillion won a number of large UK government contracts in the six months prior to its liquidation, even after it had issued a number of profit warnings. This begs the question of why the British government continued to award contracts to Carillion, especially at such low margins where there is a responsibility on the government to exclude any bid which is “abnormally low”. The Irish construction sector may be growing but they continue to face challenges of rising costs and low profitability with negative cashflows on projects – all of which can become endemic if tendering at levels that are not sustainable. Had the board of Carillion acknowledged the situation the company was in at an earlier stage, it may have been possible to save the company. A restructuring of debt may have been painful for all stakeholders, but had action been taken earlier it is possible that liquidation could have been avoided. If a company is facing cashflow difficulties or is under increased pressure from lenders, the best option is to seek advice on how to tackle the issues early on before liquidation becomes the only option, as was the case for Carillion. If you or your company has been effected by the liquidation, are having cashflow issues or wish to speak to someone about restructuring your business, please do not hesitate to contact our restructuring and insolvency team for a confidential consultation. * Since writing the above, it has emerged that work has been postponed on the six Irish projects Carillion were involved in. Work has stopped on all sites as subcontractors have raised concerns over payments following the liquidation of Carillion. These projects are part of a joint venture with Dutch Infrastructure Fund (“DIF”), a fund management company, and there is now an onus on DIF to put in place rectification measures to ensure the projects are completed. The Taoiseach stated that it would take a “few weeks” to resolve the uncertainty over the completion of these projects. It remains to be seen how long any these projects are delayed and if you have been affected by this and required advice in relation to same, please do not hesitate to contact us.